For this year's Open Quarter, Maison Marine is delighted to showcase artist Hayley Brown who will be giving demonstrations; you'll have the chance to hand paint your own lampshade to use in your own home. Hayley is well known for her sell out art classes at the Victoria & Albert Museum in London where she taught Mughal Flower painting and Jain Manuscript painting. She also teaches private students and has taught at Charleston in Sussex, home to the Bloomsbury artists Vanessa Bell and Duncan Grant. Hayley is very happy to be returning to Charleston in Sussex, home to the Bloomsbury artists Vanessa Bell and Duncan Grant as recently seen on 'Life in Squares' BBC drama. This summer she will be running a day workshop introducing you to the wonderful technique of 16th Century Indian Flower Painting. Students will create their own small memento bookmark and learn the art of colourfilling, burnishing, outlining and shading with specialised Indian single hair brushes. Complete beginners welcome. Please contact www.charleston.org.uk for bookings. The Art of Jain Manuscript Painting at the Victoria and Albert Museum, London. Artist tutor Hayley Brown returns to the V&A March 26-28th 2011. After a sell out and popular course in Indian Miniature Painting at the V&A in 2009, Hayley has been invited to teach Jain Manuscript painting workshops as part of the new Jain Pedia digital and manuscript display. An article by Hayley Brown has featured in the February issue of 'Young Jains Magazine' and this will soon be included on the website for 'The Institute of Jainology'. For further information contact the Victoria and Albert Museum Education and Short Courses Program Manager. Sep to Dec 2009 'Indian Summer', Hastings Museum and Art Gallery, Hastings, Kent. Jun 2009 'Folkestone Art Society Spring Exhibition', The Grand, Folkestone, Kent. Dec 2008 ‘Hop Gallery Christmas Craft Show’, Hop Gallery, Lewes, East Sussex. 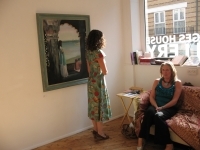 Sep 2008 ‘An Indian Summer’, Georges House Gallery, Folkestone, Kent. May 2008 ‘Microcosm’, Joint Exhibition, Chimaera Gallery, Folkestone Kent. Dec 2007 ‘December Art Show’, Group Exhibition, The Creative Suite, Star Gallery, Lewes. Sep 2004 ‘Ancient – Modern’, Joint Exhibition, Broadstairs Library, Kent County Council. May 2004 ‘Stuff in the House’, Open House, Hanover Art Trail, Brighton Fringe Festival. Aug 2003 ‘Ancient – Modern: Her Sacred Whole’, Georges House Gallery, Folkestone, Kent. May 2003 ‘Mother Daughter Exhibition’, Church Mouse Gallery, Hythe, Kent. Apr 2003 ‘Folkestone Art Society Spring Show’, Grand Hotel, Folkestone, Kent. Jan 2003 ‘Selected Works’, Treatment Rooms, Retail Therapy, North Laines, Brighton. Dec 2002 ‘Folkestone Art Society Winter Show’, Grand Hotel, Folkestone, Kent. Sep 2002 ‘Folkestone Art Society Autumn Show’, Grand Hotel, Folkestone, Kent. Aug 2002 ‘My Mother – My Self’ Joint Exhibition, Georges House Gallery, Folkestone, Kent. Artist with 'View of Taj Mahal from Red Fort'. Georges House Gallery, Kent. 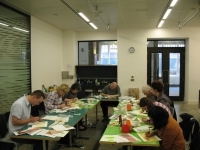 Jain Manuscript Painting Workshop at V&A. Student's Illuminated Text at V&A workshop.